When you’re a frequent traveller, you sometimes find yourself bumping into old friends, family members, and business contacts at airports, in hotel lobbies and on planes. When it happens it’s a lovely surprise, but discovering you missed an opportunity to meet up can be annoying – and think of all the times you must have passed someone you would like to have seen and never even found out. Managing a busy diary is a challenge and finding time to get together can be hard, so what if you didn’t have to rely on luck when it comes to making the most of these potential opportunities to meet? 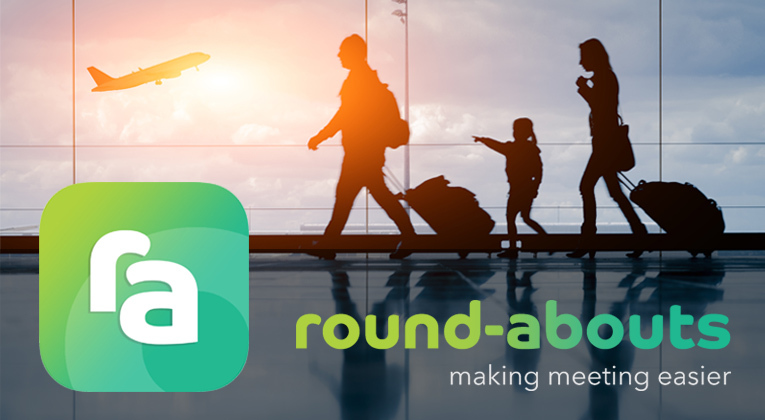 round-abouts is an app specifically designed to connect you with your contacts when travelling and help you make the most of your time. It’s very simple to use – all you need to do is download it (free), enter a few details of where you’ll be, when you’ll be there (be as broad or specific as you like) and who you want to share this with. The app will then tell you if any of your contacts are going to be ‘round-abouts’ too. You can also invite your friends to join you directly through the app, and if you decide to connect the in-app chat makes it easy to arrange getting together. Unlike other meet-up or scheduling apps, round-abouts is completely discreet. There’s no open broadcasting of your plans and only you choose whether to connect with your contacts or not. Business professional? – maximise your opportunities to meet. Log your attendance at an event, exhibition or conference and discover which of your contacts are planning to be there too. Or make your upcoming airport time work for you. See who’ll be travelling at the same time and meet in the lounge or at the bar. Cabin crew? – make the most of your layovers. Download round-abouts, input your schedule and find out which of your colleagues are going to be in the same place – meaning you never need to miss an opportunity to meet up. Social life simplification – find out who is planning to be in the same place as you at the same time or invite contacts to join you at your holiday destination, a sporting event, transiting to/from an airport, a concert or a night out. round-abouts is available to download free of charge from the Apple Store and Google Play. It is compatible with iPhone 5 and above as well as iPad and iPad Pro. 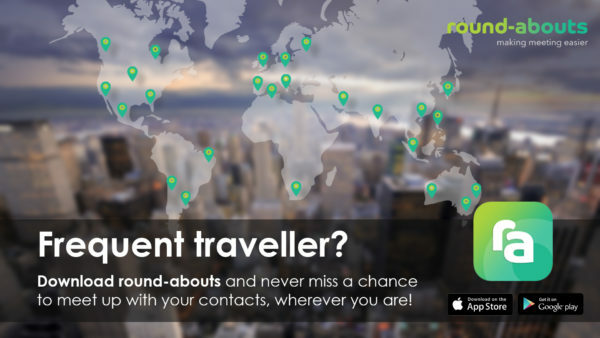 Aimed at both social and professional users, round-abouts is the first mobile app to let you see in advance when your contacts are planning to be in the same area at the same time as you. Automatically alerting you when relevant contacts’ itineraries overlap with your own, the app allows you to take advantage of opportunities to meet up that you might otherwise miss. For more information visit round-abouts.com.